When that strange man came to your door selling fertilizer how were you supposed to know what kinds of trouble it would cause? Well, maybe you should have known something was off when you saw the fertilizer was a sparkling green formula in a crystal bottle that came in a red velvet lined box. But you used it just like that odd salesman told you too, spreading the elixir on your pumpkin patch in the light of the full moon you began to wonder, "Have I been duped?". It didn't take long for you to realize that you had made a good investment. In just a couple days your little pumpkin plants grew to be the size of a breadbox. The leaves were a brilliant lime green, different for pumpkin leaves but hey, your patch sure looked fresh. Then your pumpkins started rolling in, a month earlier than usual. You were worried about the pumpkins making it to late October but they kept on rolling in, piling up. You could have kissed that salesman's pockmarked face. Then one night, after an evening counting your pumpkin patch money, you heard it: a scratching at your window. 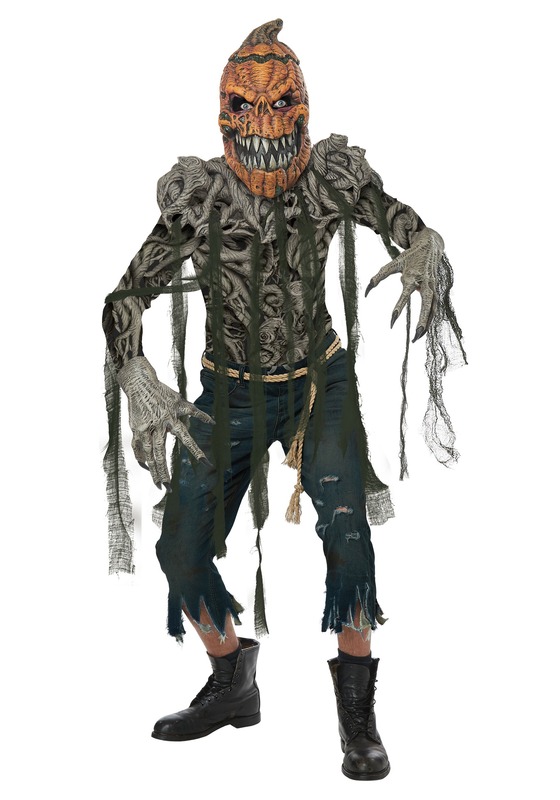 The pumpkin man was at your door, ready for the second installment of your fertilizer payment. . . your soul. This costume is an intricate and spooky creature that you never ever want to show up at your door asking for anything, even an innocent cup of sugar. The body is made with an intricate vines shirt and the head is a wrinkled terror of a gourd. And those over-sized hands? Perfect for chucking pumpkins at people fleeing in terror. Well, you be the judge, the pumpkin yield was high, your plants look great. But if you are going to use Miracle Grow next year, we won't judge you. Never got so many compliments about a costume. Shrieks, people jumping when they turn around, walking the long way around, and even some crying little ones hehe. When people of all ages keep telling you "cool costume" you know you got a winner. When ever i stood still there was an uneasiness of passer-byes expecting a jump scare or wondering if i was a person or not. Definitely glad i got it. It does run small so get a larger size if your in doubt.